Staff is nice but when we called about the power issue in the kitchen they were not too sure how to handle it. Then when they called to say someone was coming to look at the power I had to tell her that the handyman had already been there and could not fix the problem. She had no idea of this and i had to ask for someone else. Beautiful quiet place. Great for a retreat. Old work charm with modern amenities. Pool is beautiful and the patio is a great place to relax. There were several billing issues with the final payment. The phone staff were helpful in resolving the challenge created when Eastern Shore made an error with billing. We were, however, pleased that staff considered requests for an additional day and early check in. Text and e-mail communication was also appreicated during the vacation. Thank you. Our family enjoyed the overall Broadwater View experience. The location was excellent, and the house was a fit for our interests and vacation needs. The access to river, pool and grounds was terrrific for our active teenagers. We did rent paddleboards and a kayak from a local provider. The house was modern in its amenities, and we made the most of the porch and eating areas. The proximity to Easton, Oxford, and St. Michaels was an improvement on our prior rental in Neavitt, and we had fun exlporing the area. Web site very user friendly. Duck Cove Cottage was just adorable. Very cozy. The area was so quite. Loved sitting on the porch and waiting for the crab boats to come in. Easy to get around, had no problem finding anything. Even took a day trip into Oxford. Loved the Neavitt area! Osprey Point is a lovely home on a great piece of property. The house makes the most of the water views. We just wished the pool were heated, as the water was very cold during our stay, mid-June. In all, we had a great week. Thanks! The Eastern Shore team was terrific, making our stay seamless. The keyless lock system--so that we were able to just arrive at the property--was quite convenient. What a beautiful property. 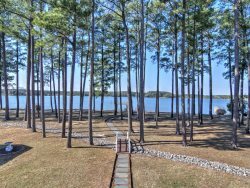 The waterfront setting is stunning: the house is set on the mouth of the Choptank, with broad water views. The lawn is gorgeous, and the grounds are very well kept. Even the driveway is exceptional: it is a classic manor house in every sense. We spent our days by the pool, and the evenings around the fire pit. I'd get up early to watch the sunrise from the dock. I could easily see the plentiful crabs, so we'll set crab pots the next time we visit. The house is well-appointed and comfortable inside. We were thrilled with every aspect of our stay. Be sure to bring bug spray as, being right on the bay, there were many bugs at night. Jessica and Brian provided superior customer service and attended to our requests quickly, politely and professionally. Town & Country is the perfect bay vacation home. From the waterfront views to screened porches to the partial shaded pool; every detail was perfect. Beautiful kitchen, open floor plan, dual master bedrooms make this the ultimate St Michaels experience. We've now rented several times with the ESVR team, and it has been a positive and easy experience each and every time. Terrific, friendly folks who try very hard to deliver a positive vacation experience. Great to work with them! We loved Off the Grid - its layout and location on the property are excellent, with views all around. The house is convenient to the dock and the waterside. The kitchen is now well equipped overall. There's a great fire pit, and the pool and hot tub are beautiful. Grounds were very, very well maintained. It's a super property. Two small suggestions. 1) We could never figure out how to get the internal or external stereo system working - some specific directions on that would be helpful and 2) the "property operations" handbook (i.e., important house tips) needs updating to address trash removal, home wifi password, etc. The only other caveat is that if you plan to dock a boat and move in/out of the Choptank River, you need to be very, very mindful of the tides or you can get locked out of the cove until the tides rise again. The property was great -- as advertised. Beautiful property, easy check-in and quick responsiveness, enough kitchenware, etc. I would say my biggest complaint is that when you are spending $1,000/night somewhere, you expect certain things: enough toilet paper, paper towels, trash bags, laundry and dish detergent, etc. There was definitely not that at this property. Seems like a simple solution -- go to Costco, stock up on all that stuff, and make sure your guests have what they need so they don't have to make 5 grocery store runs in 3 days because they keep finding things they need to buy. MANAGER RESPONSE: Glad to see you had a good time and enjoyed Lovely Cove. As is standard practice in the industry, we provide a "starter" amount of paper products and toiletries, however, those items are the responsibility of the guest. Please be sure to refer to our FAQ page http://www.easternshorevacations.com/faq.asp#planArrival) or your Rental Agreement for a clarification of what is and is not provided. Team members were quick to answer emails which was great! The water views were amazing and the house was extremely spacious and met all our needs. The house was very nice- it had everything we needed. The location and view were beautiful. We will be going back for sure!! The only thing we had a problem with was the front door. It didn't latch properly. If we weren't careful the door would swing open unexpectedly. Please be sure to fix this as a small child or pet could wander outside. Jessica was professional and answered all of my questions promptly. House was lovely and perfect for the 6 of us. It was super clean. It was also larger than we expected, with 3 full bathrooms. We expected 2 plus 1/2 bath. We could have used a few more glasses, as some were cracked. There was a boat dock as advertised. No boat ramp was advertised, so none was expected; however, it was tricky to get into/out of our kayaks and canoe and SUP off the dock, especially at low tide. But, we managed, and got better at it by the 3rd day. We had a fabulous time but the place was lacking: no soap in any of the bathrooms, towels were thin and some of them just rags, beds were all very hard and uncomfortable, pots and pans very poor shape, dishes need to be replaced, no cereal bowls or salad plates, no red wine glasses, only 2 packs of dish washer detergent and two very small bottles of dish detergent, only 1 roll of toilet paper for each bathroom, poorly organized kitchen. We felt as though all of this should have been provided. The house itself was beautiful and roomy as were the grounds. We loved the water and the pool and surrounding area. We had a marvelous time but would not return unless the above changes were made. MANAGER RESPONSE: Thank you for your feedback and glad to hear you had a great time. As is standard practice in the industry, ESVR provides a few small things such as a starter roll of toilet paper, dish soap, etc. until you are able to get to the grocery store, however, as per our rental agreement these items are not provided by the owners. We have let the homeowner know that an inventory of kitchen items is in order to replace/stock up the items you mentioned. We appreciate your taking the time to let us know about your experience. I never spoke to a living soul. All communication was done by email and texting. Simplicity Cottage is a piece of heaven. Just loved it.